Charming audiences wherever they have played, BALKANISTAS will get you stamping, yelling and whirling in a righteous storm of dance, frivolity and fun. A large, exuberant ensemble of musicians from Wellington and around the globe, BALKANISTAS have stamped their large gypsy footprint firmly on the local music scene. Formed in early 2013 BALKANISTAS won the people’s choice award to perform at WOMAD 2014, then went on to perform as the warm-up act before 15 World of Wearable Arts (WOW) shows in Wellington in September / October 2014, gaining rave reviews and critical acclaim. BALKANISTAS’ music features original and traditional songs, reflecting the diverse and energetic melodies and rhythms of the Balkans. 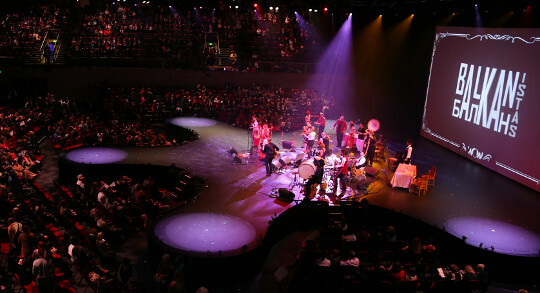 It boasts a unique line-up including accordions, violins, clarinets, brass, percussion, bass, sousaphone, tuba, vocals and a bouzouki. Come and experience the force that is the BALKANISTAS experience. "Balkanistas were perfect, they are one of the best bands..."